When Pat Tillman was deployed to Iraq for the first time, he did something he had done throughout his love affair with his wife, Marie — he wrote her a letter. Except this one was never meant to be read. It sat through two deployments on the bedroom dresser, eventually buried under piles of receipts and greeting cards. Then, during Pat’s tour in Afghanistan, Marie got the news she had long feared. Her husband would never be coming home. That night, she crept to the bedroom dresser, unearthed the letter and opened it. She immediately recognized his familiar scrawl. The pages were a mess of ink and scribble. There were words and whole sentences crossed out. Still in shock, Marie had not cried since she heard the news of her husband’s death. Reading his words, she wept. Marie thought of the hundreds of letters that they had shared during their 11-year relationship — an affair she chronicles in her book “The Letter: My Journey Through Love, Loss, & Life” (Grand Central) out Tuesday. Leaving aside the fact that 77 years later, many of Roosevelt’s socialist leanings serve as a roadmap for President Obama, the inescapable reality of 2010 is that the only thing we have to fear is political unaccountability, an unethical media, liberal judicial activists, and those among us who want and demand something for nothing. If you are a citizen who still believes in traditional values and the need for a free, strong and secure America, then it’s well past the time to make your voice heard. At the risk of being accused of inciting sedition by ultra-wealthy, far-left “journalist” Joe Klein, I would stress if not now, when? If not you, who? As an aside to Klein, who apparently, as he runs around purposely twisting the words of Sarah Palin, Glenn Beck, and Sen. Tom Coburn, R-OK, by claiming they come “dangerously close to incitement to violence,” has never read the writings of well-known seditionists Thomas Jefferson and Abraham Lincoln. Sacrilege. Had Lincoln uttered those very words today, Klein, the editorial board of The New York Times, and the inhabitants of the West Wing would have called for his imprisonment. More than imprisonment, all but confirmed Supreme Court nominee Elena Kagan would have stated Lincoln’s belief deserved no First Amendment protection. While Chief Justice Roberts called Kagan’s argument “startling and dangerous,” the mainstream media has done all in its power to keep this totalitarian declaration from the American people. Beyond liberal judicial activism and the propagandists for the far-left in the media, our welfare, security, and very existence are being threatened by elected officials from both sides of the aisle who see the rapidly descending blade and purposefully ignore it as they suicidally focus on their own selfish needs. Were it not for the fact they are about to take the rest of us with them, their extinction would be a welcome relief. To ensure the demise of our once great nation, we are also being assaulted by an unimaginable and lethal U.S. debt combined with the out-of-control salaries and pensions of local, state, and federal employees and the unions who seek to protect and grow that money at any cost. While we all now recognize that Los Angeles and California are the Athens and Greece of the United States, we need to understand that they are but the poster children for what is about to befall us. On a recent trip to Miami, I was disturbed but not shocked to find out that while the median income for the hardworking citizens of that city is about $26,000, the median income of the city employees is about $76,000. Triple that of those who pay their salaries. Roosevelt was wrong, as are all today who believe in something for nothing. It’s not fear we have to worry about. It’s the minority among us who deliberately steal, lie, brainwash our children, and leave our borders and nation unprotected, that we have to not only shield ourselves from, but defeat before it’s too late. That is the calling for the majority. Let us hope it does not fall on deaf or compromised ears. The Call for Obama to Resign: Gaining Steam with Military, Veterans? Dishonesty and Violation of the US Constitution and oaths of office of officials now come into play as relates to our National Character, National Security, Economy and the Nation’s well-being and is the rationale for resignations. Demand Resignation of derelict officials by the people of this country in now required. Lincoln issued this warning in his inaugural address, “Any people anywhere, being inclined and having the power, have the right to rise up and shake off the existing government and form a new one. This is a most valuable and sacred right – a right which we hope and believe is to liberate the world.” Being a representative republic, not a democracy, “rising up” means other than revolution by means of arms. The people must “rise up” from the grass roots across this great country as we think of the greater good of this and future generations. We are limited in the peaceful transfer of power…resignation, death, elections, and impeachment. “We the People” have had enough. Enough is Enough. The Obama White House and identifiable Members of Congress are now on a progressive socialist, treasonous death march and are bankrupting and weakening the country. We have watched them violate their sacred oath of office. “We, the People” cannot wait for and solely rely on the next round of elections in November of this year. It is now and each day that these public servants must put the citizen’s interests above self-interest by resigning immediately. Our so-called Representatives and Senators are more interested in party loyalty than performing their duties. So, do not expect them to resign en masse or be impeached. Therefore the “people” must decide. A civil uprising is brewing. We now must call for the immediate resignation of Barry Soetero (AKA President Barack Hussein Obama) …..based on Incompetence, Deceit, Fraud, Corruption, Dishonesty and Violation of the US Oath of Office and the Constitution. And a call for a National Petition for new elections to select the next President of the United States of America must be initiated. We can wait no longer for a traditional change of Power and New Government. Author AKA John GaltPosted on June 9, 2010 June 9, 2010 Categories "1984", 2012, America, American Freedom, American History, American Military Veterans, Education, Federalist Papers, Founding Fathers, Freedom of Speech, Goverment Idiots, Government Corruption, Government Fraud, Heroes, MilitaryTags Barack Obama, Freedom, Government Lies, Individualism, Patriotic Resistance, Paul E. Vellely, politics, resignation, Stand Up America1 Comment on The Call for Obama to Resign: Gaining Steam with Military, Veterans? 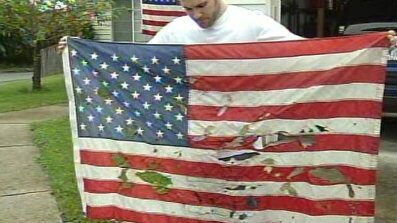 Christian Ashby, of Portland, Ore., holds an American flag that was vandalized outside of his home sometime late Saturday or early Sunday. From Oregon to Minnesota to Ohio, vandals trampled on Old Glory over the Memorial Day weekend. In one Ohio town alone, approximately 25 American flags were found set ablaze on Monday. At least one national veterans group called for those responsible for the “shocking and reprehensible” acts of vandalism to be quickly arrested and prosecuted. Police in Wooster, Ohio, were going door-to-door early Tuesday in search of the people who torched roughly 25 flags and flagpoles along Saunders Drive and Morgan Street, Capt. John Quicci said. “They were set on fire,” Quicci told FoxNews.com, adding that an investigation is ongoing. No suspects or motives had been identified, according to Quicci, who was unable to estimate damages to the 3-by-5-foot flags and the 10-foot metal poles placed outside of residents’ homes by the annual Wooster Rotary Parade of Flags project. The people who torched the flags face charges of criminal damaging and arson, Quicci said. “We’re treating this very seriously,” he said. In Minneapolis, a fire was set late last week to an American flag hanging outside a Marine veteran’s home. The residence was spared and no injuries were reported, but the flag was destroyed. Elizabeth Hawley said she found the ashes Thursday morning and called the act “very disturbing.” She said her husband is keeping his feelings reserved, but she knows he’s upset. Hawley told the Minneapolis Star Tribune that she thinks the flag-burning was a random act of vandalism. In Portland, Ore., Christian Ashby and his wife awoke Sunday to find their American flag torn down, covered in obscenities and burned outside their home, KPTV.com reported. Flying the flag has special meaning to his family, Ashby said. Ashby said a local man who served two tours in Vietnam loaned him another flag after posting news of the vandalism online. Ryan Gallucci, a spokesman for AMVETS, a national organization representing 200,000 veterans, said he found the acts of vandalism “shocking and reprehensible,” particularly on Memorial Day weekend. Gallucci called for quick closure to the ongoing investigations in at least three states. This Memorial Day, there’s one gravesite I’ll make sure to visit. The only problem is, I don’t know where it’s located. But I’m sure the object of my search is definitely dead. That would be the thing I call the Great American Backbone. Remember when this nation, and its leaders, had backbone? That backbone must be dead. How else do you explain Mexican President Felipe Calderon swaggering into Washington D.C. earlier this month, proclaiming Arizona’s law requiring cops to question those legally stopped about their immigration status “discriminatory,” and getting a standing ovation from some members of Congress? How else do you explain the silence from most members of Congress after Calderon urged them to pass another law banning assault weapons, as if he had the business to presume to tell us how to run our country? Calderon is the one who can’t get a handle on drug gangs waging a veritable insurrection in his country. You’d have thought those Democrats who cheered him on would have mentioned that, but they were too busy groveling. It was the most craven display since Nation of Islam leader Min. Louis Farrakhan chumped members of the National Association of Black Journalists – at their own convention. That one happened in 1996. The NABJ had invited Farrakhan as the keynote speaker. He spent most of his speech dissing the journalists, talking about how their “failure” to go to bat for him when the “white media” criticized him. After he got through telling them how worthless they were, the journalists rose to their feet and gave him a standing ovation. I’m betting most of them were Democrats. “It’s inappropriate for you as a head of state to comment on our nation’s internal matters. Furthermore, Mr. Calderon, our nation liberalized its immigration laws considerably by passing the Immigration and Naturalization Act of 1965. Yes, that’s what Obama should have told Calderon, and would have told him, if he had the backbone. But Americans who cast ballots in the presidential election of 2008 didn’t go for backbone. We went for change, hope and the audacity of hope. We had little use for backbone, and in Obama, we’ll never get it. But my search for the gravesite of the Great American Backbone may be premature. Maybe it isn’t dead. Maybe it’s simply fled the Democratic Party and taken up residence in … Sen. John Cornyn of Texas. It was Cornyn who chided both Calderon and Obama for the Mexican president’s stepping out of line with his comments. It was Cornyn who mustered the backbone to tell Mr. “We Send Back Them” that if he wants to be part of America’s debate about illegal immigration, then he’s more than welcome to move to this country and apply for citizenship. When Obama and the rest of the nation’s Democrats were getting seconds and thirds of wuss juice, Cornyn was in the line getting an extra dose of backbone. I hope he has enough to spread around to the Democrats. Examiner columnist Gregory Kane is a Pulitzer-nominated news and opinion journalist who has covered people and politics from Baltimore to the Sudan.